It's a little long, but it's a great way to see why Susan is running for Town Councilor-at-Large and it features testimonials from Don Levy at the Town Diner and some other families in town. I think Susan's really the only candidate who has much of a website, and if you haven't seen it yet, click over to www.susanfalkoff.com right now. There is great information about who she is and why she is running for Town Councilor-at-Large. Susan even has a campaign blog. Election Day is next Tuesday, November 6. If you contact the Susan Falkoff campaign at falkoff2007@aol.com, they can help you get to the polls. 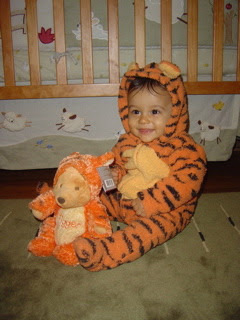 Dressed up as tigers for Halloween. I feel a bit bad that after I paid such loving attention to the Democratic primary race in Massachusetts' fifth district I've gone missing for the entire stretch of the general election. Unfortunately, the triple pressures of a baby, a full-time job, and yet another campaign have left me with little time for blogging. In any case, today is the day that voters of the fifth finally decide who will replace former Congressman Marty Meehan. Democrat Niki Tsongas (interviewed here) is favored to win over Republican Jim Ogonowski, though the race has been close by Massachusetts standards. Really, though, nine points is a comfortable margin in a competitive race. I can't see Ogonowski winning for three reasons -- he has been incomprehensible on SCHIP, I don't think he can match the Democratic Party's GOTV operation, and Unenrolled voters don't tend to vote in special elections at the rate he would need them to. There's always a chance that enough Democrats would cross party lines because of immigration or some other reason, but I have yet to see evidence of that in a Federal-level race in Massachusetts. Historically, Democrats are much loyal to their party's nominee for Federal office than for state or local office. In any case, if you're able to volunteer for Tsongas today, Blue Mass Group has some ways to help.